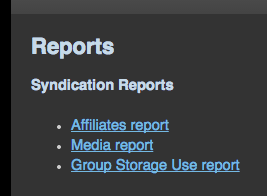 If you have Syndicated content to the TelVue Connect Media Exchange and want to know who Licensed (downloaded) them, the “Reports” feature gives you all that information at a glance. When you are logged into TelVue Connect first make sure you are in your own Connect Organization work space by clicking the Connect tab at the very top of the page (i.e. make sure you are not clicked within the Media Exchange tab). Now hover over the Administration tab on the far right, and then click the Reports menu item on the bottom. That will take you to the reports page. * Affiliates – list of all stations that have licensed your syndicated shows. You can click to expand and see a list of shows licensed by each affiliate. * Media – list of all shows that have been licensed by affiliates. You can click to expand and see a list of affiliates for each show.